Pupils from Deans, Letham and Meldrum Primary School’s attended Livingston FC on Tuesday 06 March for a Show Racism the Red Card Event organised in partnership with West Lothian Council and Livingston FC. Guests on the day included ex-professionals and Show Racism the Red Card coaches Gary MacKay, Derek Ferguson, Jim Duffy and Michael Weir, along with representatives from West Lothian Council and Minister for Youth Employment Angela Constance. The guests spoke about their experiences of racism and sectarianism and offered advice on how to deal with, and combat, racism and sectarianism whenever it occurs. 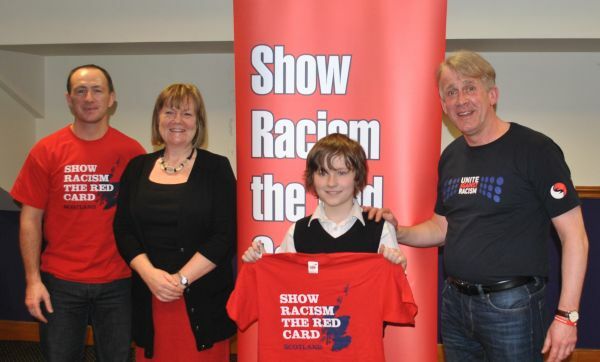 "Show Racism the Red Card’s current partnership with the West Lothian Council demonstrates a clear commitment to stamping out racism and sectarianism in the region. This kind of work equips young people to deal with racist and sectarian attitudes and behaviours. Schools in the area are very keen to engage with the campaign and the young people we have worked with are very positive about it." Pictured above: Show Rcaism the Red Card coaches / ex-professionals Derek Ferguson and Gary MacKay with Grace-Ann Wallace, Curriculum for Excellence - Health and Wellbeing Co-ordinator, West Lothian Council and a pupil from Deans Primary School.